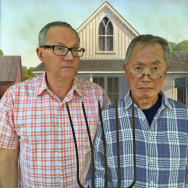 Brad and George Takei, the new typical American married couple. 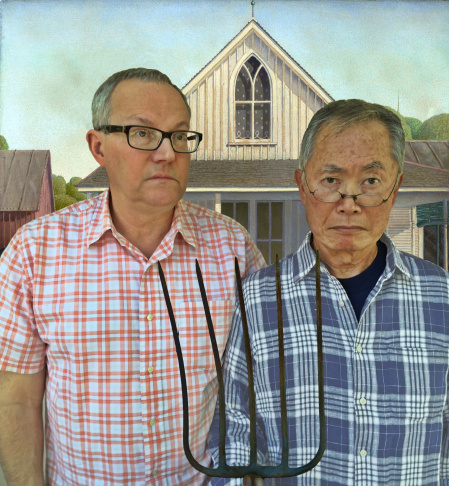 Brad and George Takei, posing in "American Gothic" style at their Hancock Park home just a few days before moving to New York for the duration of "Allegiance" on Broadway. It opens October 6. UPDATE: “Allegiance” will be performed Feb. 21-April 1, 2018, at the Aratani Theater at the Japanese Cultural and Community Center in downtown L.A.'s Little Tokyo. 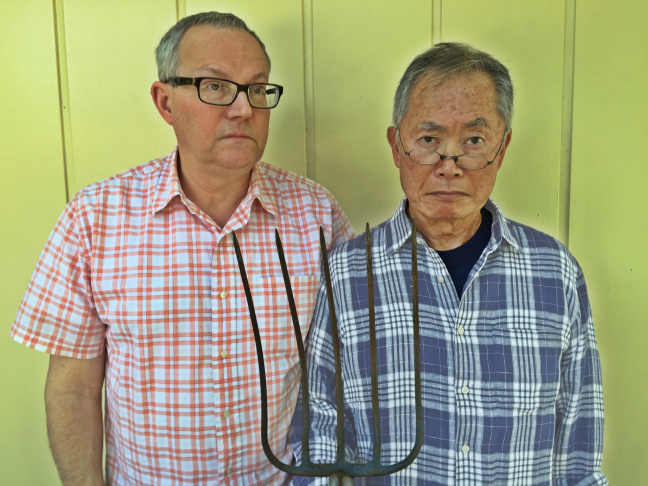 ORIGINAL STORY: In an intimate interview, George Takei tells Off-Ramp host John Rabe about crafting the Japanese-American internment camp history into compelling Broadway musical theater. "Allegiance," with Takei, Lea Salonga and Telly Leung, played at the Longacre Theater. George Takei and his husband Brad were putting their house in mothballs when I arrived for our interview in August. They'd already been spending a lot of time in New York because of George's recurring role on "The Howard Stern Show," but now, with the Broadway opening of "Allegiance" just a couple months away, they were preparing to move for as long as the musical brings in the crowds. While Brad went off to deal with the mundane domestic tasks around the move, I sat with George in their living room to talk about turning one of America's most shameful episodes — the internment of some 120,000 loyal Japanese-Americans during World War II — into a musical that could make it on the Broadway stage. George, you just sent an email to your fans with the subject line: "I've Waited 7 Years to Send You this Email. Seven years!" Inside, you wrote: "Few things are as difficult and complex as taking a show to ‪Broadway‬. It's both thrilling and terrifying." What was terrifying? "The terrifying part is, you've poured your passion, your energy, your resources ... you make all that investment in that project, and then you're hoping the seats are going to be filled.That 'what if' is terrifying. But in San Diego, we had a sold-out run and broke their 77-year record. But now we're going to Broadway, and that same fear is there. Will they come? What will the critics say? Because it's life or death." It took a long time just to get a Broadway theater. "It took a long time to get a theater.You think there are a lot of Broadway theaters, but there are even more productions that want those chunks of New York real estate. So we thought we'd get in line. But then the other discovery we made is that the theater owners have relationships with grizzled old producers who have brought them a vast fortune with enormous hits, and they can cut in line. They have a track record. And so, 'will we ever get a theater' became a big question. 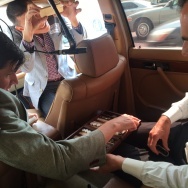 But we have this time now — let's use it creatively, productively." So, Takei says, the team tweaked the show, removing parts that didn't work didn't advance the story, inserting numbers that worked better and kept the story moving. They doubled down on social media, building and proving demand in the show. 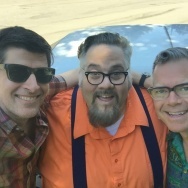 "We have a Shubert theater (the Longacre), and Bob Wankel is head guy there, and I remember pouring my heart out, telling the story of my parents, hoping that touches. And he was understanding, but I understood his problem, too. Everybody is trying to get a theater and he has to make a good business decision and was initially skeptical. An internment camp musical? But music has the power to make an anguished painful situation even more moving, even more powerful. It hits you in the heart." This is your Broadway debut, right? Are you petrified? "Yes, yes. I've done a lot of stage work, and I've done a lot of public speaking, but it's Broadway, and I'm a debutante... at 78 years old! And it's the critics, too. The New York Times, Ben Brantley. That's who I'm going to be facing, and so it's both exciting and absolutely filling me with ecstasy, but what makes it ecstatic is the fear." For much more of our interview with George Takei, listen to the audio by clicking the arrow in the player at the top of the page ... and hear George Takei and John Rabe's duet of "Tiny Bubbles." Off-Ramp exclusive: Tom Hanks and George Takei on "Larry Crowne"